The days are getting longer and some days are even sunny! Rebecca and Kewpee have been here all winter and have visited the nest box regularly, sometimes even in the snow. You can see some snowy visits in a few video clips from February. Now that it is March, they are showing signs of getting ready for the next nesting season. They are in and out of the nest box a lot. Kewpee, especially, will sit on the edge of the box and survey the territory. They spend time within sight of each other, each doing their own preening routine. Kewpee demonstrates that he is still a good provider and brings food to the box and Rebecca swoops in and flies away with it. 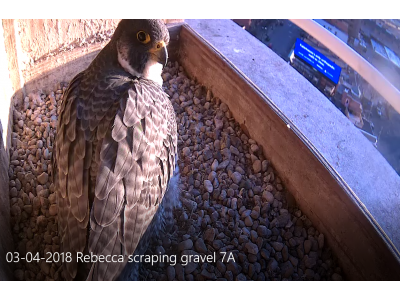 Check out the video clip from 02-04-2018 for a quick replay of Peregrine dating. And they have created a scrape (a shallow depression) in the gravel which is where eggs (hopefully) will be laid. Both birds perform the scraping routine almost every time they are in the box. You can see Rebecca doing this in the video clip on 3/4/2018. I have not gotten any reports of mating activity but will be looking for that within the next couple weeks. Stay tuned.